A new craze hit the Philippines during the time when I was in one of the lowest point of my life. It’s a Korean show that’s “tagalogized” (translated into Filipino) and was aired in one of the biggest network in the country. I ignored it for awhile because I thought it’s just a hype. However, my interest definitely increased when the Filipino celebrities were discussing the characters of the show on air. The Pinoy Channel site didn’t help much to satisfy my curiosity because the first three (3) episodes were nowhere to be found. Thus, I opted to use youtube instead. And voila, I found the episodes I was looking for. I was glued to my screen watching one episode after the other. I was hooked! In three (3) days time, I finished watching all the 25 episodes… Talk about youtube marathon! O_O The story was simple but it was the excellent portrayal of he characters that made it interesting. They were all magnificent that you can literally feel that you’re with them (if you know what I mean ). The main characters, Gu Jun Pyo and Geum Jan Di, were always arguing. Their fights were nicely done and well executed. I really like the show because it’s fast paced and you can see that the scenarios were realistic and everyone can relate to it (in my point of view that is… :p). I was so stressed out at that time but whenever I remember a scene, it always brought an automatic smile on my face. 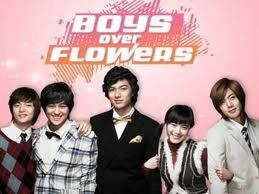 And guess what, I’ve watched Boys Over Flowers for five times and I’m planning to watch it again soon. Call me nuts… I don’t care. Aja! F4 and Geum Jan Di. Aja!